The coalition for the minimum wage initiative in Arizona includes Living United for Change in Arizona (LUCHA), the California-based Fairness Project, and the New York-based Center for Popular Democracy. The drive to raise Arizona’s minimum wage to $12 an hour is more than halfway toward its goal of qualifying for the November ballot, supporters announced Tuesday. The Fair Wages and Healthy Families campaign proposes boosting the current $8.05 hourly minimum to $10 on Jan. 1, 2017, and gradually increasing it to hit $12 an hour by 2020. After that, it would be adjusted annually to reflect changes in the consumer-price index. Tip workers would see a base hike to $9 an hour. The initiative also would require employers to offer mandatory sick leave: five days a year for companies with 15 or more employees and three days a year for those with fewer than 15. Tomas Robles, deputy campaign chairman, said the group has collected nearly 90,000 signatures toward the 150,642 required to qualify for the ballot. 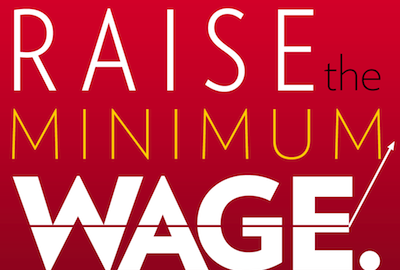 The campaign is one of several drives across the country to increase the minimum wage. Ballot efforts are underway in Colorado, Maine, Washington state and Washington, D.C. Last month, California enacted a law that creates a $15 minimum wage. In Arizona, the campaign has reported donations of $30,000 from Living United for Change in Arizona, where Robles was executive director, and $25,000 from the California-based Fairness Project. In addition, he said the New York-based Center for Popular Democracy, which is backing numerous minimum-wage proposals, has made a “six-figure” contribution to LUCHA that will be formally disclosed at the end of the year under a non-profit corporation filing. Robles said the campaign is using a mix of paid and volunteer signature gatherers and expects to spend at least $2 million to get the measure on the ballot. One thing will be different this year than a decade ago. At that time the business community, confident a state like Arizona would never vote to increase wages, didn’t even bother to mount a campaign against the initiative. The result was a blowout, with Proposition 202 passing by a margin of close to 2-1. Glenn Hamer, president of the Arizona Chamber of Commerce and Industry, said Tuesday that business interests are not going to make that mistake again. “I would expect you’d see a very strong response to this, and a very broad response from chambers, major trade associations like the (Arizona) Restaurant Association to fight this should it qualify,” he said. But proponents are hoping to counter that by building a coalition of small businesses who say they can live with a $12 minimum wage. At Tuesday’s press conference, one of the members, Stephanie Vasquez, owner of Fair Trade Coffee in Phoenix, detailed her support. “I deeply believe that as an entrepreneur and as a human being that people should be treated with respect and dignity,” she said. Vasquez said the majority of her staffers already are being paid more than the $12 the initiative would mandate. “I seek to provide a space where my team is healthy and able to provide for their most basic needs, and provide mentoring and resources so that they, too, could achieve their goals,” she said. The campaign also has picked up support from politicians, though to this point, they’re all Democrats. “No one who works a 40-hour work week should be living in poverty,” said Maricopa County Supervisor Steve Gallardo. One political side note to the fight is that Gallardo will be at odds with another supervisor, Republican Steve Chucri. He heads the state restaurant association. So concerned is Chucri about the initiative drive that his organization tried to get lawmakers to put an alternative on the ballot, one that would take the minimum wage to $9.50 an hour by 2020. It also had something else businesses wanted that does not exist either in current law or the initiative: a preemption of local ordinances creating “living wage” requirements above what the state mandates. That measure was approved by the Senate but died in the House when most members of the Republican majority refused to go on record as supporting any sort of minimum wage hike, even one the business community wanted. The failure of that measure will leave voters with the only options being to keep the current law or approve the $12 alternative. Hamer said that could create some problems for foes. You can bet that no one from the Low Wages Party (Tea-Publicans) and their campaign finance supporters in the various chamber organizations — I can smell the stench of their “dark money” disinformation campaign already — will spend whatever it takes to deny working men and women a living wage in Arizona, one of the poorest states in the country, Arizona remains among worst in poverty (Arizona ranks third-worst in poverty the nation. Only Louisiana and Mississippi have higher rates. ), while they rake in their corporate welfare tax breaks from our lawless Tea-Publican legislature. This is the GOP culture of corruption at its finest. Please tell me how one signs a petition they support, when one is pretty much housebound and never out where the petitions might be available? I definitely support this one. Call them up and see how to go about doing that. They should call it Proposition to Treat People with Respect.